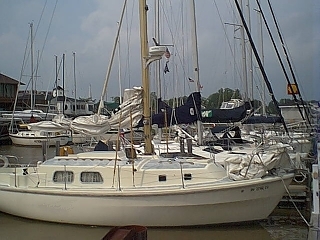 It was as a cool but sunny day at a marina in Fair Haven, Michigan. I had driven five hours to meet with the marine surveyor who had agreed to give me an assessment about a boat that my wife and I had first seen a week earlier. He gave a sideways look at the twin-keeled hull that stood in front of him. "Why do you want to buy this? ", he asked. When we pulled off the weathered plastic tarp, the hull that emerged had an uncanny resemblance to a Killer Whale rather than a sleek cruiser/racer that I was used to seeing. He followed his first question with another, "After I finish the survey, will you be ready to walk away from this deal?" I said, "Yes", and the adventure began. Over the next few hours we had an on-going conversation about all the specters and demons which hate old boats. One by one we set aside the terrors of delamination, rot, and water in the core. Cosmetically, this ugly duckling would really need to be loved. Her high cabin trunk and bulky form meant that she would never win a beauty contest. Beyond that, the ports had leaked and the interior finish was peeling, but the wood was not stained with mold. The previously painted hull was scuffed and thick bottom paint was peeling, but she was solid. Could this British Lady come back from the edge and be the ocean-capable craft that we had been seeking? 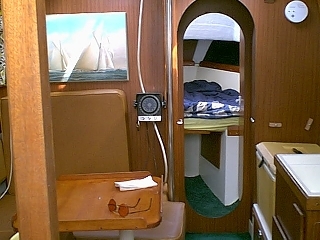 In the end, we sat in the cabin with the loose wiring and the sagging headliner and talked about cruising in the Caribbean. "I can't think of a single reason why you shouldn't buy this boat," said the surveyor. The boat was still a long way from being commissioned, but my hopes were launched that day. The name on the transom was Golden Willow, but to us, she would be known as Drinian, after the Captain of the Dawn Treader in C.S. Lewis' The Voyage of the Dawn Treader. If you ever read the book, you know that very little is said about or by Lord Drinian. He was just steady and reliable, never flashy. The name seems to fit.